Home/Dr. Bayati Recognized by Vitals.com and Top Plastic Surgeon Reviews! 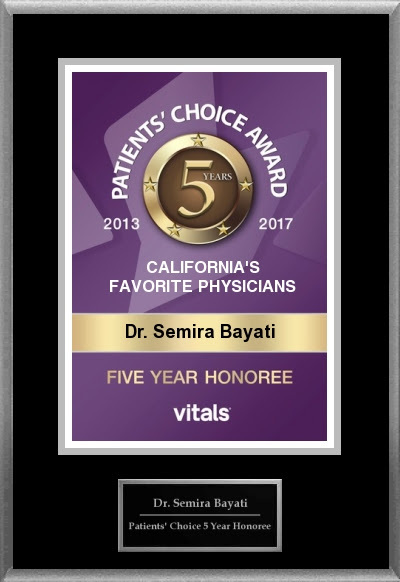 Dr. Bayati Recognized by Vitals.com and Top Plastic Surgeon Reviews! Patients’ Choice 5th Anniversary Award – The Patients’ Choice Award: This honor is given only to doctors who have had ratings that reflected excellence in care for 5 consecutive years. Only 1% of doctors in the U.S. are bestowed the Patients’ Choice 5th Anniversary Award. In addition, Dr. Bayati has been named a Top Plastic Surgeon of 2018 by Top Plastic Surgeon Reviews. This organization only honors ABPS-certified plastic surgeons who have received some of the highest online reviews and ratings from patients. Dr. Bayati and our entire team wish to thank our wonderful patients for their kindness and support. We are truly grateful to serve the beautiful community of Newport Beach, and we will stay committed to providing the best possible care for many years to come!